What are Local Artisans ? Local Artisans are the backbone of the heritage of a community. What is an artisan? An artisan is a worker in a skilled trade, especially one that involves making things by hand. It also refers to items that produced in a traditional way . Local artisans demonstrate the folk-life skills representative of a region. Without the effort of these demonstrators many of these useful skills would disappear. I live in the upstate part of South Carolina. For the many years, I was a part of a community celebration of local artisans. Luckily for me, this opportunity is was a mile from my home. The Hagood Mill Historic Site & Folklife Center is located just off Hwy 178 about 3 miles north of Pickens, South Carolina. The site boasts an operational water powered grist mill built in 1845. A mini festival is held here on the 3rd Saturday of each month year-round. Visitors to the site can see the mill in action and buy stone ground grits and cornmeal to take home. I am not able to be there each month but you will always find something to do and see. In addition to the grist mill, special music events and other programs are a part of the Hagood Mill 3rd Saturday event schedule. But the heart of the mill is the artisan skills demonstrated by local people. On a 3rd Saturday morning, you may find the bowl carver working under the big cedar tree. 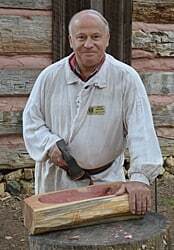 He is carving a bowl from a large chunk of wood using primitive tools. On one of the covered back porches, sit a spell and talk to the chair canner. His talented weaving is breathtaking and true works of art. 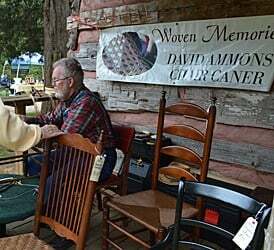 Visitors see many skilled crafts demonstrated at the Hagood Mill on 3rd Saturday. These demonstrations include quilting, arrow making, survival skills, wood carving, weaving, pottery, blacksmithing and others. 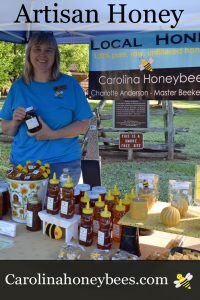 My father (James Jones) and I present a beekeeper’s booth (Carolina Honeybees) at the event. We have missed some months due to health or work but it is an event that we have enjoyed. 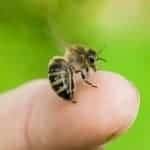 We speak to other beekeepers and non-beekeepers from across the world. 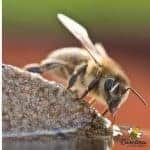 The public is aware of the problems facing honeybees and have many questions. Most of the local artisans have items for sale. This gives shoppers the opportunity to buy wonderful unique items. Products produced by local artisans provide a “taste of the community”. They are not mass produced but created one at a time or on a very small scale. You will not find local artisan products in a warehouse store. Enjoy the artisan shopping experience- walk up to the table, hold the product in your hand and talk to the person who made it . 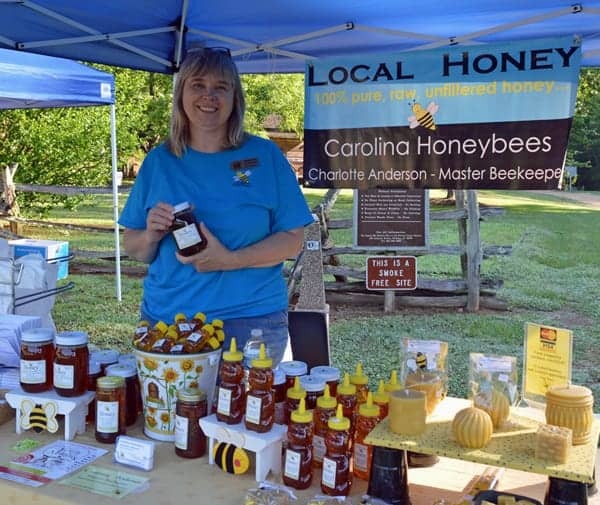 Whether you are considering a bottle of honey, a quilt, a wooden bowl, or a beeswax candle your purchase helps promote the local community. We see the beauty but we do not see the work and/or expertise that has gone into preparing these products for sale. Most local artisans do what we do for the love of our products not the money. However, let’s be real. Without some income many artisans (myself included) could not continue to participate at area events. Many producers are true business owners who pay sales tax, income tax and insurance. Granted our “store” may be under a tree with grass on the floor instead of carpet but we still have business expenses. Handmade, local artisan crafted items are treasures. Please keep this in mind when you visit your area festivals or local artisan bazaars.